For hundreds of years, dark clouds covered the skies of Adamah, and an ageless king ruled. Those who emerged with one of six extraordinary Shay powers were forced into the king's army, an unmatched force with inhuman Strength, Speed, Accuracy, Perception, Empathy, and Healing. With the army at his side, the king a man who wields all six abilities was invincible and unquestioned in his rule. To most, serving the king was an honor. And for some, it was a fate worse than death. When 17-year-old Nolan Trividar witnesses the transformation of his brother from kind to cruel after entering the king's army, he vows never to follow the same path. So when his own power the Shay of Accuracy comes upon him at the Tournament of Awakening, Nolan conceals his emergence instead of joining the king's ranks. For years, he traitorously hides his power, pretending to be a gifted scribe. But when Nolan comes face-to-face with a deserter, the man discovers his secret. To evade detection and a death sentence, Nolan escapes with the deserter and flees into a night filled with dark creatures who steal both powers and souls. Nolan joins a resistance, a village hidden deep in the forest, filled with others who secretly wield a Shay. But his peace is short lived when they discover that the dark clouds, the undead creatures, their own decreasing powers, and even the king, are all connected. For hundreds of years, dark clouds covered the skies of Adamah, and an ageless king ruled. Those who emerged with one of six extraordinary Shay powers were forced into the king's army, an unmatched force with inhuman Strength, Speed, Accuracy, Perception, Empathy, and Healing. With the army at his side, the king a man who wields all six abilities was invincible and unquestioned in his rule. To most, serving the king was an honor. And for some, it was a fate worse than death. 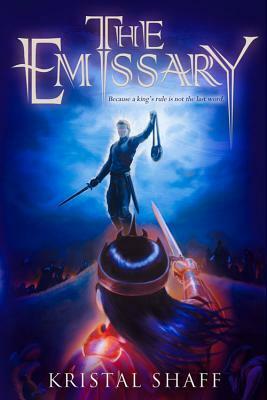 When 17-year-old Nolan Trividar witnesses the transformation of his brother from kind to cruel after entering the king's army, he vows never to follow the same path. So when his own power the Shay of Accuracy comes upon him at the Tournament of Awakening, Nolan conceals his emergence instead of joining the king's ranks. For years, he traitorously hides his power, pretending to be a gifted scribe. But when Nolan comes face-to-face with a deserter, the man discovers his secret. To evade detection and a death sentence, Nolan escapes with the deserter and flees into a night filled with dark creatures who steal both powers and souls. Nolan joins a resistance, a village hidden deep in the forest, filled with others who secretly wield a Shay. But his peace is short lived when they discover that the dark clouds, the undead creatures, their own decreasing powers, and even the king, are all connected. Kristal Shaff is a writer and professional face painter. Her first job was shelving books at the library. She loves to explore strange and fantastical worlds in her choices of movies and fantasy fiction. She lives in Camanche, Iowa.